Often, the greatest inventions are those which simplify necessary tasks. Such is the case with Jan Matzeliger, the man who made it possible for ordinary people to purchase shoes. Jan Matzeliger was born in Dutch Guiana (now known as Surinam) in South America. 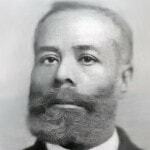 His father was a Dutch engineer and his mother was born in Dutch Guiana and was of African ancestry. His father had been sent to Surinam by the Dutch government to oversee the work going on in the South American country. At an early age, Jan demonstrated a remarkable ability to repair complicated equipment and often did so when accompanying his father to a manufacturing plant. When he turned nineteen, he decided to travel away from home to explore other parts of the world. For two years he labored aboard an East Indian merchant ship and was able to pay a visit to a number of countries. In 1873, Jan decided to stay in the United States for a while, ending up in Pennsylvania. Even though he spoke very little English, he was befriended by some African-American residents who were active in a local church and took pity upon him. Because he was great with his hands and mechanically keen, he was able to obtain small jobs in order to make a living. At some point he began working for a cobbler and grew to become interested in the making of shoes. At that time, more than half of the shoes produced in the United States came from the small town of Lynn, Massachusetts. Still unable to speak more than basic English, Matzeliger had a difficult time obtaining work in Lynn. After considerable time, he was able to begin working as a shoe apprentice in a footwear factory. 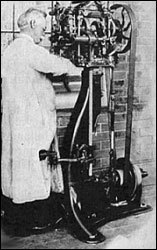 He ran a McKay sole-sewing machine which was used to fasten different parts of a shoe together. Unfortunately, no devices were around that could affix the upper part of a shoe to the sole. As such, attaching the upper part of a shoe to the sole had to be done by hand. The people who were able to stitch the parts of the shoe together were known as “hand lasters” and expert ones were able to generate about fifty pairs of shoes in a ten hour work day. They were held in high regard and were able to demand a high fee for their services, especially after they banded together and established a union called the Company of Shoemakers. Because the hand lasters were able to charge so much money, a pair of shoes was very expensive to purchase. Hand lasters were confident that they would continue to be able to demand higher amounts of money for their services declaring “… no matter if the sewing machine is a wonderful machine. No man can build a machine that will last shoes and take away the job of the laster, unless he can make a machine that has fingers like a laster – and that is impossible.” Jan Matzeliger determined that they were completely wrong. After working all day, Matzeliger took classes at night to learn English. Soon, he was able to read well enough to study books about physics and mechanical science. This permitted him to produce a number of inventions. Lacking adequate funds, he was unable to patent these inventions and observed helplessly as other people claimed to have created the devices and collected the financial rewards they brought. Matzeliger did not lose hope over these situations because he was already thinking of a more important invention – the shoe laster. Watching hand lasters all day, Matzeliger began understanding how they were able to connect the upper parts of a shoe to the sole. At night he sat creating methods for emulating the mannerisms of the hand lasters and sketched out approximate drawings of a device that might work in the same manner. Soon, Matzeliger began putting together a raw working model of his creation. Missing the proper materials, he used whatever leftovers he could find, including cigar boxes, thrown away pieces of wood, scrap wire, nails and paper. After six months, he believed he was on the right track but knew he required better materials in order to take the subsequent steps. Though he attempted to keep his invention a secret, people found out, including the expert hand lasters he was trying to “compete” with. These people belittled and made fun of him and tried to discourage him pursuing his objective. He ventured on, however, and decided to try to raise money in order to improve his working model. He was offered $50.00 to sell the device he had developed up to that point but turned it down, knowing that if people were interested in purchasing it, he was on the right track. As he improved upon the device, additional offers of money came in, some as high as $1,500.00. Matzeliger could not bear to part with the device he had put so much effort into making so he held out until he arrived at a deal to sell a 66% interest in the systems to two speculators, retaining the other third interest for himself. With the new inflow of cash, Jan completed his second and third models of the machine. At this point he applied for a patent for the device. Sadly, Matzeliger would only take pleasure in his success for a short time, as he was afflicted with tuberculosis in 1886 and passed away on August 24, 1889 at the age of 37. As a result of his work, shoe production capabilities increased as did efficiency. This permitted for lower prices for consumers and more jobs for laborers. Matzeliger left behind a legacy of taking on what was thought to be an impossible task – making shoes affordable for the masses.